Workstations based on the Intel® Xeon® processor E3-1200 v2 product family are much more than a turbo-charged Intel® Core™ processor-based PC. They are a workload-optimized innovation platform designed to deliver the processing, graphics and bandwidth capacities artist, animators, analysts, engineers, scientists and other professionals ...demand in order to accelerate their innovation. From Computer Aided Design (CAD) to number-crunching to video editing or image processing, compared to a desktop PC an Intel Xeon processor E3-1200 v2 product family-based workstation will provide the intelligent performance that is demanded by many professional applications. Still, not everyone needs a workstation. A typical office worker running standard office applications such as word processing, e-mail, and presentation software will get all the performance needed from a standard business PC. Beyond processing speed and capacity advantages, Intel Xeon processor E3-1200 v2 product family-based workstations provide users increased levels of reliability, stability, and potentially accuracy when compared to business or consumer desktop solutions. 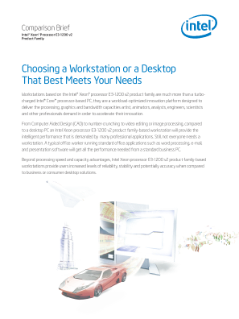 Intel® Xeon® processor-based workstations are purpose-built for professionals. Through an array of technologies, they offer users the opportunity to explore more ideas in less time—making it more likely to potentially arrive at the ideal solution. They accelerate end user insight and innovation. Video: Four IT managers talk virtual desktop management.